"Bruce and family. It is never easy to say goodbye to our..."
"So sorry for your loss, Bruce. We will miss your Mom. May..."
"To Georgette's Family, Please accept my condolences. In the..."
SCARBOROUGH - Georgette L. Flaherty passed away Nov. 23, 2018, at the Gosnell Memorial Hospice House, following a brief stay there. Mrs. Flaherty was born in Westbrook, the daughter of Walter and Eugenie Pomerleau LeBel. She attended Westbrook schools, graduated from Westbrook High School as salutatorian in the class of 1941, and was also a graduate of Northeastern Business College in Portland. She was employed for a brief time by the New England Tel. & Tel. Co. Portland office. Georgette married William P. Flaherty, the love of her life in 1945, and worked in Civil Service at Walker Army Air Base, Hays, KS where he was stationed. She also worked for Carr Bros. Fruit & Produce in Portland and the Boston, Mass. office of the S. D. Warren Co. Most of her 25 years of employment were in Westbrook's S. D. Warren Research Laboratory and Technical Sales Dept. – a fluent writer and well-organized person, she was a secretary and administrative assistant there until retiring in 1985. 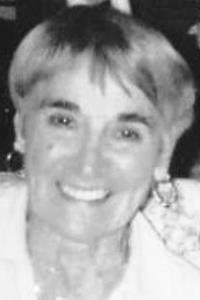 Mrs. Flaherty was an active member of the Parents Clubs in the Deering area for several years and was a long-time member of both the Westbrook Woman's Club and the Sun City Center Woman's Club. She also was a member of Westbrook Senior Citizens and the Irish-American Club in Portland. Georgette's interests were numerous and varied – ranging from politics, ballroom dancing and house plants to antique china and glassware collections. She particularly enjoyed leisurely strolling along the beach at their summer cottage in Prouts Neck. A well-liked person, she also thoroughly enjoyed any and all social functions that arose and hated missing any of them. Georgette was easily identified by her consummate interest in fashion and styling, both in clothing and interior decorating. A source of personal pride was her intellect and razor-sharp memory, traits which lasted through her later years. Mrs. Flaherty was predeceased by her husband of 70 years William Flaherty. She is survived by a son, Bruce Flaherty of Augusta; nephews Stephen and Larry LeBel, both of Muskegon, Mich.; and was very grateful too for the friendship of Ella, Janice and others. At her request private funeral arrangements are being made with Dolby, Blais & Segee Funeral Chapel in Westbrook, with internment in St. Hyacinth Cemetery. Please visit www.dolbyblaissegee.com to view Georgette's tribute page and to sign her online guestbook.